When Facebook launched their like button in 2009, it was mostly used to show the author of the post your support and acknowledgment. With enough likes, you can increase the value of certain messages and promote the reputation of the author. 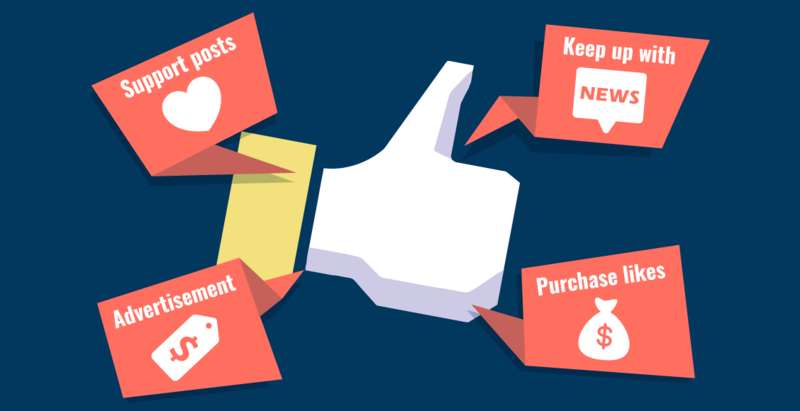 However, the like button isn’t just used as an “I like this!”, but it is also used by people who are just interested in certain posts or who want to draw the attention of their Facebook friends to an important topic. you see what someone else is interested in because he / she likes it. In that case, a post with a not so pleasant content can gain lots of likes, even though the users do not actually support it. To prevent this problem, Facebook released “Reactions” in 2016. Beside the “like”, users can now use different emojis to react to a post, for example an angry emoji. Though the like button became a much more important component of social networks over time. It can help the user to keep up with news on specific topics by liking a Facebook page. This feature isn’t just useful for the user, but also for the operators of the social network: The operators evaluate the „likes“ of their users, in order to offer personalized advertisements and other like suggestions. For a Facebook page to gain more reputation it needs more likes. That’s why different agencies offer likes to purchase. These agencies commission Facebook users around the world to click on the „Like“ button on a page of the client. For instance, you can buy likes and followers for Instagram through a machine in a shopping mall in Moscow. The company “Snatap”, who developed those machines, want to include Facebook, Twitter, Youtube and Vimeo soon too. After the launch of Facebooks like button, many other social networks wanted to join the hype. Youtube for example, changed their star-rating system into a like and dislike button, since the users only used one or five stars. Twitter too, changed their favorite button into a heart shaped like button. But there is the opposite too: Pinterest removed their like button in 2017. The reason was that it confused users, since they didn’t really know the difference between the „save“ and „like“ button.